Thank you for your support during this difficult time. Please enhance this tribute to Virginia by adding your memories and photos. 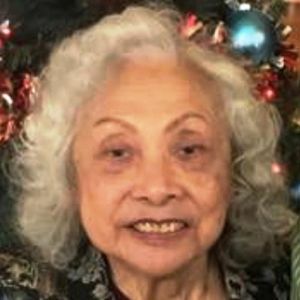 Virginia Robles Fitch, 86, of Ladson, SC, widow of CPO John Thomas Fitch, USN (Ret.) entered into eternal rest Tuesday, March 5, 2019. Her Funeral Service will be held Thursday, March 14, 2019 in J. HENRY STUHR INC., WEST ASHLEY CHAPEL, 3360 Glenn McConnell Parkway at 2:00 p.m. The family will receive friends from 1:00 p.m. until the time of the service. Interment will follow in Live Oak Memorial Gardens. Virginia was born June 6, 1932 in Iloilo City, Philippines, daughter of the late Felix Robles and Julianna Vicente. She became an American Citizen in 1966. Virginia was an avid bingo player and loved dancing with her husband. She enjoyed making clothes, and sewing mother and daughter outfits, her granddaughter's prom dress and sewing outfits for her friends. She was a devoted military wife. She is survived by her two sons, Charles Anthony Fitch (Cathy) of Mount Pleasant, SC, Edward Lee Fitch (Ellen) of Walterboro, SC; daughter, Hattie Ann Halsey of Marietta, GA; seven grandchildren, Jessie, Heather, Brent, Ashton, Dustin, Derek and Dawson; ten great-grandchildren. Memorials may be made to the Hollings Cancer Center Office of Development, 86 Jonathan Lucas Street, Charleston, SC, 29425. My sincere condolences to the Fitch family. May you allow God to comfort you this difficult time. God bless each of you. I'm sorry for your loss, please accept my condolences. May your hearts soon be filled with the wonderful memories that you all shared together. Take care and stay strong. We will miss her her husband and her were good neighbors and friends we will miss them both RIP .You will be with John and the Lord . My heart goes out to the Fitch Family and their loved ones. I will pray for your strength and peace in coping with this unimaginable loss. She will always be remembered as a loving person who was a Mother, Grandmother and Great Grandmother. May her soul rest in peace. Aunt Virginia will be missed. Sorry for your loss. I knew she is now back with Uncle Tom. Life Stories provides friends and families a forum to post their favorite stories and memories of Virginia Robles Fitch ensuring the precious experiences are never forgotten. Share joyful times, post a photo that captures the moments you cherish, and allow others to reply, relive and remember.